The Maldivian Supreme Court has suspended the presidential election run-off, after protests from a candidate. On Saturday, ex-President Mohamed Nasheed polled nearly 47%, just short of the 50% needed for outright victory. The second round was to have taken place on Sunday, but the runner-up Abdulla Yameen sought a delay, saying he needed time to campaign afresh. Mohamed Nasheed has been seeking to regain power after he was forced to resign in 2012, sparking a political crisis. This is the third time the presidential elections have been derailed. A vote on September 7 was annulled by the Supreme Court after one candidate, Gasim Ibrahim, alleged irregularities, despite observer groups deeming the vote free and fair. The court also introduced new guidelines for elections. Police then halted a planned re-run on October 19 saying the guidelines had not been met, after both Gasim Ibrahim and Abdulla Yameen failed to approve the voter register. This time, the run-off was planned for only one day after the first round, because the constitution stipulates there must be a new president by Monday. Despite that legal deadline, the Supreme Court sitting late at night has now ruled that the run-off “cannot take place” and ought to be delayed by six days. The court said the Sunday run-off might have “undermined the constitutional rights of many people”, agreeing with Abdulla Yameen’s assertion that he needs more time to campaign. 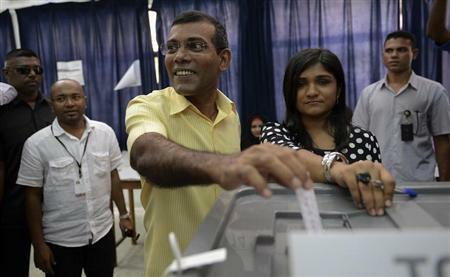 Mohamed Nasheed won Maldives’ first-ever democratic vote in 2008, replacing Maumoon Abdul Gayoom, who ran the country autocratically for three decades. On Saturday, Mohamed Nasheed polled 46.93% of vote, while Abdulla Yameen, the half-brother of Maumoon Abdul Gayoom, polled 29.73%. Third-placed Gasim Ibrahim, a wealthy resort owner and a former minister under Maumoon Abdul Gayoom, was out of the running with 23.34%. The suspension of Sunday’s voting means there cannot be a new president by the constitutional deadline of November 11, when the term of current president President Mohamed Waheed Hassan ends. The Supreme Court had already announced that the current president could stay on but Mohamed Waheed Hassan has said he doesn’t want to. Besides, some army officers have been circulating an appeal calling on soldiers not to obey the current president beyond the legal expiry of his term at midnight on Sunday. The Maldivian Democratic Party – to which Mohamed Nasheed belongs – has accused Abdulla Yameen of trying to “subvert democracy”. The ex-president resigned last year after large sections of the security forces objected to his arrest of a controversial judge.